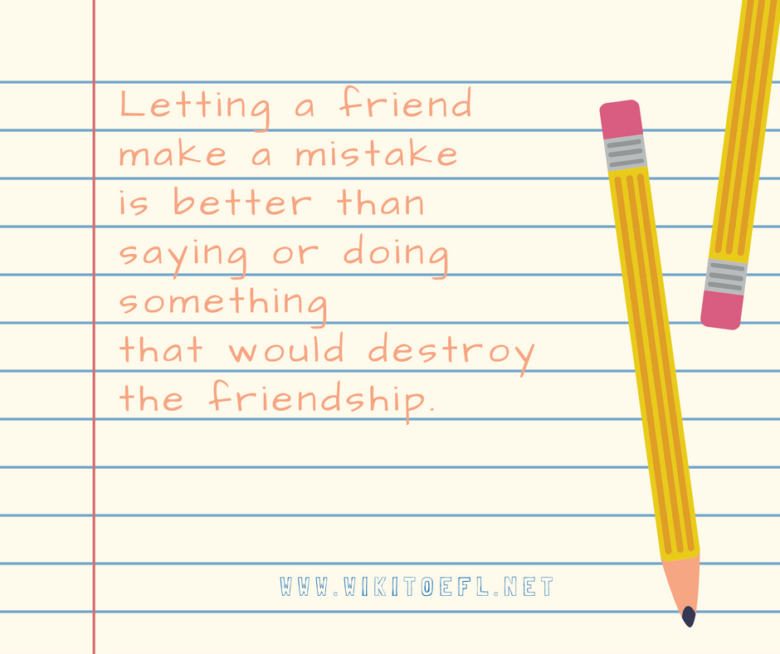 Letting a friend make a mistake is better than saying or doing something that would destroy the friendship. Dormitory rooms at your university must be shared by two students. Do you think that first impressions are generally correct or often wrong? I have seen friendships end for minor reasons. I would hate for that situation to happen to me. So I would prefer to let a friend make a mistake rather than risk an action that would cause me to lose my friend. People can learn from their mistakes. Therefore, it is acceptable to let friends make some. For example, my sister once dated a guy who was not nice. None of her friends liked him, but they said nothing to her about her boyfriend. They knew she would get mad if they commented about him. So they let my sister learn for herself how bad her boyfriend was. After a while, the two of them broke up. Fortunately, she still had her friends. And she also learned how to become a better judge of character. Thus, while she lost her boyfriend, it was a learning experience that did not cost her any friends. Additionally, most people do not appreciate others interfering in their lives. This is true even if the person’s assistance could wind up being helpful. On many occasions, I have become upset when my friends tried to advise me not to do something. Deep down, I knew they were right. But I still did not want their suggestions. I wanted to be free to do whatever I wanted even if it turned out negatively. For this reason, I hesitate to interfere in other’s lives. Instead, I let them do what they want. If it turns out well, that is great. If it turns out poorly, they only have themselves to blame. I would rather allow my friends to make mistakes than interfere with their actions and cause our friendships to end. People can use their mistakes as stepping stones, and most of them tend to hate others telling them what to do. Therefore, it is better to let people make up their own minds.